(Phys.org) —Imagine living on a planet with seasons so erratic you would hardly know whether to wear Bermuda shorts or a heavy overcoat. That is the situation on a weird, wobbly world found by NASA's planet-hunting Kepler space telescope. The planet, designated Kepler-413b, precesses, or wobbles, wildly on its spin axis, much like a child's top. The tilt of the planet's spin axis can vary by as much as 30 degrees over 11 years, leading to rapid and erratic changes in seasons. In contrast, Earth's rotational precession is 23.5 degrees over 26,000 years. Researchers are amazed that this far-off planet is precessing on a human timescale. Kepler 413-b is located 2,300 light-years away in the constellation Cygnus. It circles a close pair of orange and red dwarf stars every 66 days. The planet's orbit around the binary stars appears to wobble, too, because the plane of its orbit is tilted 2.5 degrees with respect to the plane of the star pair's orbit. As seen from Earth, the wobbling orbit moves up and down continuously. Kepler finds planets by noticing the dimming of a star or stars when a planet transits, or travels in front of them. Normally, planets transit like clockwork. Astronomers using Kepler discovered the wobbling when they found an unusual pattern of transiting for Kepler-413b. "Looking at the Kepler data over the course of 1,500 days, we saw three transits in the first 180 days—one transit every 66 days—then we had 800 days with no transits at all. After that, we saw five more transits in a row," said Veselin Kostov, the principal investigator on the observation. Kostov is affiliated with the Space Telescope Science Institute and Johns Hopkins University in Baltimore, Md. The next transit visible from Earth's point of view is not predicted to occur until 2020. This is because the orbit moves up and down, a result of the wobbling, in such a great degree that it sometimes does not transit the stars as viewed from Earth. Astronomers are still trying to explain why this planet is out of alignment with its stars. There could be other planetary bodies in the system that tilted the orbit. Or, it could be that a third star nearby that is a visual companion may actually be gravitationally bound to the system and exerting an influence. "Presumably there are planets out there like this one that we're not seeing because we're in the unfavorable period," said Peter McCullough, a team member with the Space Telescope Science Institute and Johns Hopkins University. "And that's one of the things that Veselin is researching: Is there a silent majority of things that we're not seeing?" Even with its changing seasons, Kepler-413b is too warm for life as we know it. Because it orbits so close to the stars, its temperatures are too high for liquid water to exist, making it inhabitable. It also is a super Neptune—a giant gas planet with a mass about 65 times that of Earth—so there is no surface on which to stand. "Because it orbits so close to the stars, its temperatures are too high for liquid water to exist, making it inhabitable [sic]." Point of grammar: Inhabitable means the same as habitable. The antonym is uninhabitable. From Oxford dictionary: "inhabitable (adjective) suitable to live in; habitable: soon we will run out of inhabitable space on the planet." So article should say. 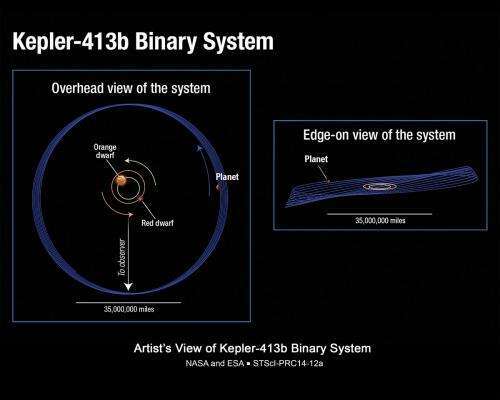 "Kepler-413b is too warm for life as we know it. Because it orbits so close to the stars, its temperatures are too high for liquid water to exist, making it UN-inhabitable." 'Inhabitable' means the same as 'habitable'. The word you want is 'uninhabitable'. 'Erratic changes in seasons', eh? Welcome to the United Kingdom. I wouldn't call that a giant gas planet, since that makes it more of a mid-to-small sized gas planet (saturn and jupiter both seem to be average, mid-sized gas planets, compared to gas planets we see elsewhere). Also, I would bet dollars to donuts that there is liquid water in the atmosphere. Since it's a gas planet, it should have the standard composition, with plenty of hydrogen and oxygen. There must be layers in the atmosphere that have water clouds. It should be hot in the upper layers from the star's heat, and hot in the center due to pressure, but the middle layers of the atmosphere should be shaded from the star and not heated that much by pressure/friction. I wouldn't even rule out water ice crystals (snow) at some elevations. Keep in mind that higher gravity/pressure changes melting/boiling points.